What a great day on the Discovery boat today. We had a full boat of people going to Koh Tao and everyone had a great time. Unfortunately I couldn’t dive today because I have a cold and would have problems equalizing so I had to stay in the office. I was up all night anyway making the food for the boat. Then I had to get up early and make it again because I ate the food last night. This is really a vicious cycle. I can’t stop my self from eating food that I cook. either way we got it sorted out and I controlled myself and we had plenty of delicious food for our divers today. The conditions were really good at Shark Island and the guys saw turtles and stingrays there. There is a great video of a turtle on our facebook page which you can get to by following the link at the bottom of our homepage at http://www.discoverydivers.com. I was watching the video and looking at the pictures and think I might go out and get myself a shell. How cool is that to have your own shell to hang out in. I think I am going to the shell store and look today. Does anyone know where the shell store is on Samui? We also had divers to Sail Rock today who had a great time also. Tomorrow we are taking our boat to Koh Tao again with team Germany and team Holland. They both completed their PADI open water course with us last week and are going out again for dun dives. The weather today was cloudy and a little cooler without the sun. Tomorrow is supposed to be sunny and no rain till later on. Maybe that will affect my plans for the full moon party. We’ll see. I’ll leave you with some pictures from today’s dives. 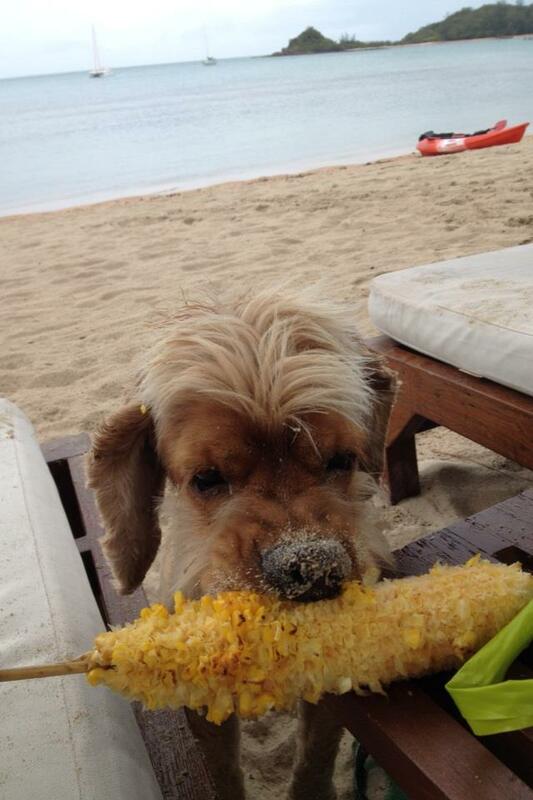 So, I’m chillin’ on the beach today in the rain and eating that famous Choeng Mon beach corn. Might as well, I either get wet diving or swimming anyway. The good news is that the big storm that was forecasted to come today, Saturday and Sunday looks like it’s gong to miss so I can get out and go diving tomorrow on my new boat. Everything is running fine and I’m just waiting for my custom-made captain’s cap to come and for some adjustments to be made so I can reach the throttle. Now that we have our own boat it is great that I can go to whatever dive sites that the customers want everyday and not have to deal with all the crowds. We still have been very busy here and today have a big group of beginners doing PADI discover scuba diving at Koh Tao, and some people fun-diving at Sail Rock. Even if it is raining on top I am sure it is still beautiful under the water. It is supposed to rain the rest of the day, but then clear up and winds subsiding tomorrow morning and then good weather going forward. Yesterday was a big day for me. I finally took my new boat out. First we started the day with a ceremony a Bhuda blessing and then did the traditional champagne christening. If you want to see video of this all it is on our facebook page where there is a link at the bottom of our website home page at http://www.discoverydivers.com. After the ceremonies we went out to Koh Tao for some diving. I hung out on the boat for the day and checked all the divers equipment and food of course. I even jumped off for some swims at the dive site. The boat ran great and we had a full boat of customers who were all very happy. The food was excellent also. Great job by our chef Dow on the food. I gave it 5 starts myself. Today we took the boat to Sail Rock and had a great day there too. Nice that I have my own boat now and can go diving everyday. I will probably take some friends out next week and teach them to dive. Unfortunately, the weather looks like it will be a little rough starting Friday till Sunday and we may have to stay in for a few days. No big deal I need the rest anyway. I’ll leave you with some pictures from my big day. Enjoy. Wow! What a day I had on my birthday. First my mom and dad woke me up at midnight and gave me a new bed, a new shirt and a bunch of toys. I think I spent about 3 hours playing until I finally passed out on my new bed. Then Dad woke me up and said he wanted to take me to show me my next present. I couldn’t believe it. It was my own boat. All that money I got from the Stolichnaya lawsuit finally paid off. So i went around and inspected everything and it all looks great. Especially the handsome guy painted on the side of the boat. I can’t wait to take it out with customers this week. After the boat I went home and found that my dad also bought me new home entertainment surround sound system. I couldn’t believe it. Now I can watch my Scooby Doo cartoons in HD. Does anyone else wonder why scooby and Shaggy never have girlfriends? Zoinks!! not sure whats going on there. If I was in Scooby’s place I would be all over Daphne. The day wasn’t over yet. About 9:00 pm Tong Naam and Deng Mo came by my house and kidnapped me and took me to the Dogpound for some celebration drinks. All I know is I woke up in someone else’s doghouse this morning and don’t remember anything. To finish it off my buddy Dayna gave a me a portrait of some really handsome dog. I am not sure who it is, but the guy is really good-looking. The shop today was busy again I hear with a bunch of open water students and fundivers and looks like we are full for tomorrow. Guess I’ll have to go in and help out at the office. The weather was beautiful today with lots of sunshine and hot hot hot. tomorrow looks the same and then maybe some bad weather coming in for the weekend. We will wait and see. Check out some great video Joe took today of a spanish dancer on our facebook page. You can reach it with the link at the bottom of our home page at http://www.discoverydivers.com. I’ll leave you with some birthday pictures. Well folks, tomorrow is the big day. My 5th birthday. I am a little bit worried though because I haven’t seen or heard anything about it yet. I already have searched the whole house and have not found any hidden presents, bones, cats, or anything. I hope my mom and dad did not forget. Maybe they are planning on taking me diving for my birthday. or to Disneyland. I hear they have some pretty big mice to catch over at that place. Now that high season is over it’s back to normal again. Busy, but not crazy. Tomorrow we got a good mix of open water courses, discover scuba divers and fundivers all going out to celebrate my birthday (I think). Today was also busy and congratulations to Irene in completing her advanced open water course. Good job. So, I am going to rest up for the big day tomorrow and get a good dream about all the presents I am going to get. Well, we got through the 2 days of rain and high winds and the guys all enjoyed their days off and now back to beautiful weather. I was getting a little sick of staying inside for two days anyway. I need to be outside and on the beach hanging out. We can’t even get Lassie movies to watch here in the afternoons and the Scooby Doo cartoons are all in Thai language. I didn’t even know Scooby knows how to speak Thai. He is smarter than I thought. Of course Shaggy is not as smart but I don’t know if “zoinks” is an english word or Thai word. After the weekend washout the gang at Discovery was back to work Monday and Tuesday with a full slate of divers and courses. Today Eric, Axel, Claudio and Joe were all on the boats to Koh Tao and Sail Rock. Now that high season is over we should start getting a little more free time to get some rest and caught up on things for the next high season only a few months away. I can even plan my November vacation now. Not sure where I’m gonna go yet, but open to suggestions. The weather here in Samui is hot and sunny again. A real scorcher today. Looks like the same for all week with high temps in the mid-30’s and no rain except maybe a little at night. Not a happy daily woof today. More like a wet woof. I am stuck here looking out at the rain and wishing I was diving. It looks like it is gong t be this way for a couple of days and in fact we already cancelled the diving for tomorrow. On a good note, I don’t have to water my garden for a few days. Now of course, not having to get up to dive for a day or two I can go out and party and not worry about getting up. Look for me at the Boneyard tonite. I’ll leave you with some pictures from this weeks diving for you to enjoy.